For some reason I never thought I would be able to photograph this galaxy. Wasn’t it supposed to be too faint, wasn’t the surface brightness too low, wasn’t it a target for much better systems than mine? I’ve no idea why, but that barrier had stuck in my mind. Looking for targets on my Sky Safari App, I noticed that the declination (the celestial version of latitude) of M33 gave it a very long track across the otherwise restricted view of the sky from my back yard. It would rise above the trees to the east and then move quite high across the open space to fall below the roofline to the west some five and a half hours later. Time for an experiment. On a night when cloud-free skies cannot be guaranteed, set the system running and leave it to its own devices: choose an exposure length that is short enough to run unguided but take as many frames as can be captured in five and a half hours (that’s a longer session than I’ve ever attempted). Why unguided? Well, a guided system has to be attended all the time. If a cloud passes across the field of view of the guide scope, the system loses the guide star and stops guiding. All subsequent frames probably have to be thrown away, so a guided session needs a greater guarantee of clear skies if it is to be left running while the operator sleeps. On the 2nd of October I set up the AZ-EQ6 mount and polar aligned to one arc minute. All other things being equal,that should allow my system’s resolution of 1.41 arcseconds per pixel to take unguided exposures of 300 seconds without star trailing. I set the timer to 150 seconds, giving a plentiful margin to absorb other imperfections in the tracking system. With a 30-second pause between frames, allowing the sensor time to cool down, I’d be taking 20 frames per hour. Next morning, all had gone as planned. That doesn’t always happen! Clouds had interfered as expected, so I took the best 58 frames from the session to stack and process. 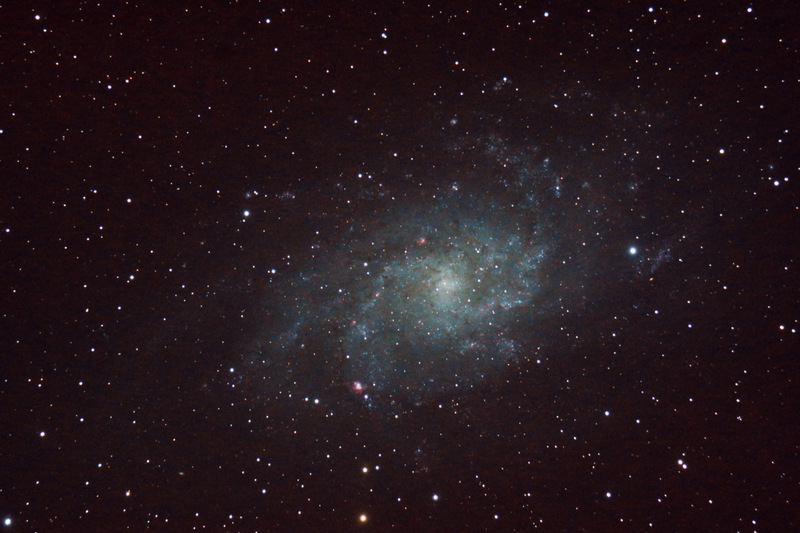 Despite the relative humidity of 80-90% throughout the night, the result is a most pleasing rendition of Messier 33 “The Triangulum Galaxy”. It is about 3 million light years away and is the third largest of the “Local Group” of galaxies which includes the Milky Way and the Andromeda Galaxy. This entry was tagged Altair Wave 115/805 ED Triplet, AZ EQ-6, Back yard, IDAS D1 LP filter, M33, Nikon D90, Unguided. Bookmark the permalink.